10THB in Bangkok, 15THB in the tourist islands. That's a big cup for a small fry. I came to regret it later. After spending a bit of time in Thailand with The Wife and my mother, I returned to Singapore and they went down south to Krabi for a bit of time at on the beach. 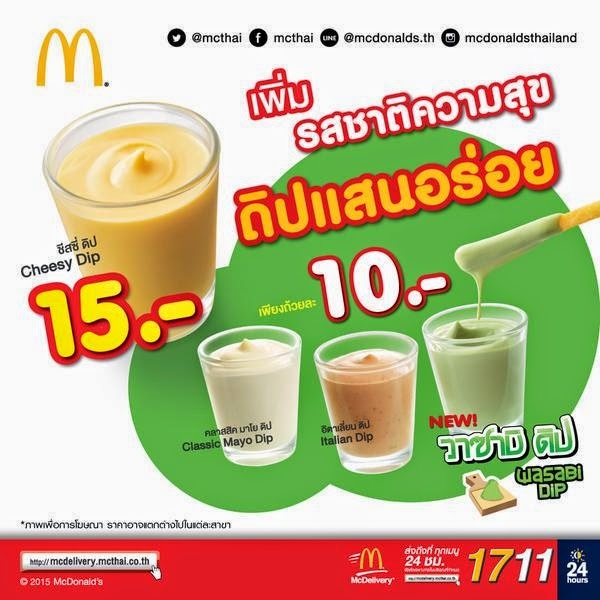 I wasn't able to track down the Wasabi dip at any of the Bangkok branches, since the introduction of the McPatongko this dip had completely disappeared from the menu. They were lucky enough to track it down in Krabi, since they get the new promo items a couple weeks after the Bangkok branches (if at all, some promos never make it outside BKK). Although The Wife was surprised when they served the dip in a large, open cup, (I had experienced this when I had the entire range of dips in 2013), The unsealed package it made it a bit of a challenge to fly back to Singapore in one piece, but she managed for her favourite husband. This isn't the first time I've had Wasabi sauce from McDonald's. I've had a Wasabi Fillet-o-Fish in Hong Kong McDonald's prior to starting this blog, a Supreme a couple years later, and McDonald's Singapore introduced the Wasabi Ebi Burger only last year. They even had Wasabi McNugget dip in Singapore, which I tried, but I strangely never bothered reviewing! Although the sauces looked almost identical, the Wasabi Dip from Thailand was actually made in Thailand, whereas the nugget dip I had in Singapore was made in China. I'm always a little weary about food made in China, so when I had the nuggets in SG, only had a cursory dip and left it at that. But I'm here to talk about the dip from Thailand. I ordered a small fry, (since this was a "dip" and not McNugget sauce) from my local McDonald's and brought it home where I had the dip waiting in my fridge. Not that I would have ordered McNuggets in Singapore anyway. When I cracked it open it didn't have a wasabi odour that you'd expect, it actually didn't really have any smell at all! I dipped some fries in and gave it a taste, and it did have a nice wasabi kick it to it, but nothing that would have causes you to pinch your nose. It was also noticeably creamier than some of the sauces I've had recently, so I'm not completely sure if this was cream based or soybean oil based, but either way, it didn't feel like it was killing me with every bite. Since I only ordered a small fry to try these with, and the cup was so large, I didn't really want it to go to waste once we had finished the fries, so I ended up dipping a couple other random items I found in my fridge. It was perfect with a hard boiled egg...It wasn't so nice on top of rice.